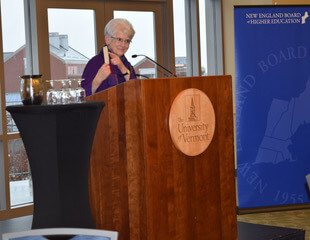 Photo Credit: Submitted - Sister of Mercy Janice Ryan addresses those gathered for the New England Board of Higher Education 2018 Excellence Award. Sister of Mercy Janice Ryan, a former President of Trinity College of Vermont in Burlington, received a 2018 Excellence Award from the New England Board of Higher Education at the University of Vermont Davis Center on Nov. 6. “Sister Janice Ryan is a lifelong advocate for education, social justice and criminal justice reform. … Her work over the years has touched many lives,” said Michael Thomas, president of the New England Board of Higher Education. Born in Fairfield in 1936, Sister Ryan joined the Sisters of Mercy and dedicated 40 years in education as a teacher prior to becoming president of the former Trinity College. After her service as president of Trinity College, Sister Ryan went to Washington, D.C., where she worked to promote fairness and justice. She served as director of justice education and interfaith relations with The Justice Project, education director for U.S. Sen. James Jeffords and project director of the Catholic Campaign to Ban Landmines for the United States Conference of Catholic Bishops. Then, in 2003, she became the deputy commissioner of the Vermont Department of Corrections and continues to work with prisoners. “The appointment to Deputy Commissioner of Corrections was a life-changing event, working with persons in DOC who believed in and practiced restorative justice concepts in the prison and through Community Justice Centers in the community,” Sister Ryan added. She was influential in the passage of the Vermont Special Education Law that was used as a prototype for Congress in developing the nation’s special education law.